New Delhi Sep 14 (IANS) Amid a raging controversy over the EVMs used in the Delhi University Students Union (DUSU) polls the Election Commission (EC) on Friday said that its machines are "completely different" from the ones used in the university polls. "The Election Commission of India uses only single-post EVMs in which vote can be cast for only one post. 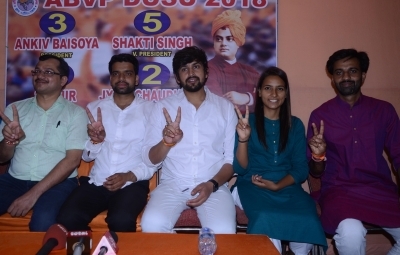 In the elections at DUSU it is said that multi-post EVMs in which vote can be cast for more than one post (for instance President/ Vice-President/ General Secretary) have been used. These machines are technically completely different from EC s single-post EVMs " the poll panel said in a statement. "We would like to clarify once again on this occasion that the EC is not responsible for protocols and procedures adopted by various organisations/ institutions in the country in the elections held by them " it added. The Congress Aam Aadmi Party (AAP) and the Left parties whose student wings participated in the DUSU polls have raised questions over the integrity of electronic voting machines (EVMs) after the RSS-affiliated Akhil Bharatiya Vidyarthi Parishad (ABVP) bagged three out of the four seats in the varsity polls. Congress leader Ajay Maken on Friday said that the National Students Union of India (NSUI) candidates were leading on the President and Vice President posts till the sixth round of counting but ultimately lost due to "tampering in EVMs". The EVMs are manufactured only by the Bharat Electronics Limited (BEL) Bangalore and Electronics Corporation of India Ltd (ECIL) Hyderabad -- both government of India-owned firms. These firms cannot supply EVMs to any entity within the country or abroad without the prior approval of the EC. In 2006 the EC had allowed the two companies to supply EVMs to the Delhi University with the rider that these would be "different" in appearance and technical specifications from the EVMs used by the EC. "The Commission would like to state that the important technical and administrative safeguards available in the EVMs used by the EC might not be available in the EVMs being used by other organisations/ institutions " the EC said. It said that old EVMs used by it are sent to the BEL and the ECIL for destruction and these are "destroyed as per strict protocol prescribed by the Commission".